A new feature has been introduced this summer, tag warnings. These warnings are meant to provide users with just-in-time information to help them avoid common mistakes in the tag they’re using (e.g. SQL questions should mention the engine they use). It seems as if it could be a really helpful feature, especially for new users, so they can avoid common pitfalls. Indeed most people seem not to read tag excerpts, but they might read a yellow warning popup. A few examples of tags for which it could be helpful are physics, computer-algebra-systems and its friends, soft-question, logic (as opposed to elementary-logic) and similar cases, publishing, extremely general tags like number, etc. See also this related discussion about "off-topic tags". I suggest that we follow the format laid out at meta.academia.SE: write down the tag name, the proposed warning text in a block quote, and some context. If your question is not about the area of mathematic logic called proof theory, do not use the proof-theory tag. Questions requesting proofs for a particular statement, or about how/why a particular proof of a statement works, should be tagged with the mathematical subject the statement lies in. This tag is almost universally used incorrectly as a substitute for the blacklisted intrinsic proof (similar to proof-writing and proof-strategy, I imagine). However it names an honest area of mathematics and should not be just done away with. Instead of generic (analysis) tag, use a tag for a specific branch of analysis such as (real-analysis) or (complex-analysis) or (functional-analysis), etc. For data analysis, use (data-analysis). This was discussed last year: Why is the tag (analysis) useful? The proof-writing tag is for advice on clear and rigorous presentation of a proof that you have in mind. If you don't have any proof yet, don't use it. This is my interpretation of what the tag is supposed to be about; the actual usage, of course, is that users want to tag with "proof" (my question is about a proof, right?) and pick one of offered options, such as this one. Linear algebra is not algebra with functions such as $y=mx+b$; it works with vector spaces. Make sure your question involves vector spaces before using this tag. I've seen many new users use linear-algebra in place of algebra-precalculus. Note that not every question involving algebra and geometry belongs in the subject of algebraic geometry. See the tag wiki if you are unsure. The tag wiki explicitely warns against abuse of this tag, and I've seen some incorrect use myself despite that. I have recently found a few questions tagged with functional-analysis which were just about the analysis of a specific function (or functions satisfying a certain relation like $f(x+y) = f(x)+f(y)$) and not related to actual functional analysis at all. I am not certain, however, if the problem is big enough to warrant an extra tag warning. This tag is for ordinary differential equations. If your question is about partial differential equations use the pde tag instead. This is a common one and a simple warning as such would clear much confusion about the use of this tag especially for new users. There are so many questions using this mark, but which are simple calculations for high school / undergraduate courses (and should use the probability tag). I've tried to edit these posts, but seeing that the same mistakes are made every day is a little disheartening. Half the tags are math questions unrelated to mathematical pedagogy. There are also a lot of questions that are "seeking personal advice" like what class/book to take/use next. If your question is about projections in linear algebra (for example, projection matrices), please use the linear-transformations tag. Projective spaces are a subject of geometry that deals with spaces which can be seen as the set of lines through the origin in some other vector space. You can also consider the tags linear-algebra and matrices, if you think they fit your question. I would advocate a warning for (or a name change) the tag complex geometry. This is supposed to refer to complex manifolds and complex algebraic geometry, but for a while the bulk of the posts were elementary questions about the complex plane such as one might find in precalculus or beginning undergraduate complex analysis. I suspect that changing the tag to complex differential geometry or complex manifolds might help with this, although each of those is a bit more restrictive than I'd like. Not the answer you're looking for? 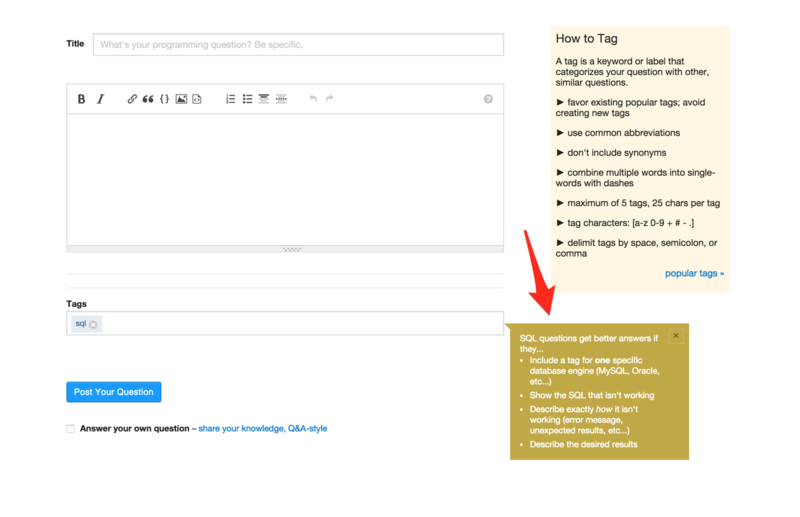 Browse other questions tagged discussion feature-request tagging warnings . Why is the tag (analysis) useful?